Corresponding author Dr. Erik Engeberg, from FAU, said: "Studying and monitoring fragile environments, such as coral reefs, has always been challenging for marine researchers. Soft robots have great potential to help with this. 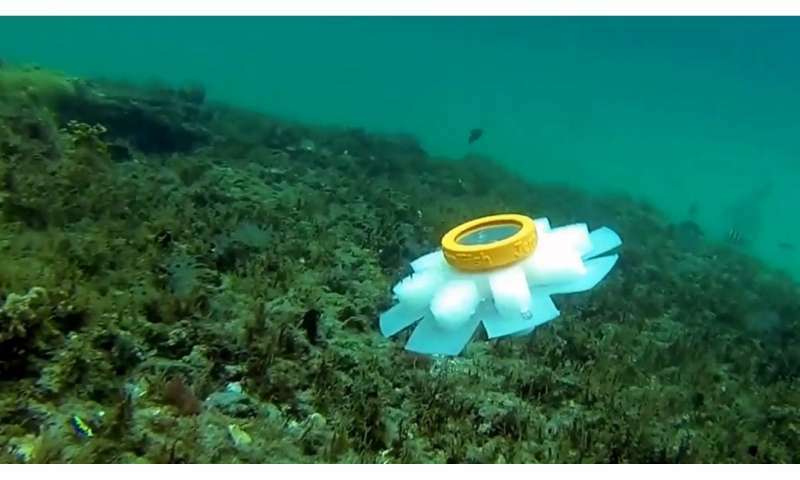 "Biomimetic soft robots based on fish and other marine animals have gained popularity in the research community in the last few years. Jellyfish are excellent candidates because they are very efficient swimmers. "Their propulsive performance is due to the shape of their bodies, which can produce a combination of vortex, jet propulsion, rowing, and suction-based locomotion." To harness this performance, the researchers used the shape of the moon jellyfish (Aurelia aurita) during the larvae stage of its life cycle. Whereas prior robot jellyfish designs used a variety of different propulsion mechanisms, the team's design for their new jellyfish used hydraulic networks for propulsion. Dr. Engeberg said: "A main application of the robot is exploring and monitoring delicate ecosystems, so we chose soft hydraulic network actuators to prevent inadvertent damage. Additionally, live jellyfish have neutral buoyancy. To mimic this, we used water to inflate the hydraulic network actuators while swimming." They also tested the robots' ability to squeeze through narrow openings, using circular holes cut in a plexiglass plate. Dr. Engeberg said: "We found the robots were able to swim through openings narrower than the nominal diameter of the robot. In the future, we plan to incorporate environmental sensors like sonar into the robot's control algorithm, along with a navigational algorithm. This will enable it to find gaps and determine if it can swim through them." Just we need, more garbage in the ocean.